Hello World....I'm mean...well at Least USA, I'm ready to Travel ! Thanks for checking out my spot here on NuRvers.com I just bought a 1994 Chevy Roadtrek 210 Popular Camper Van. I love it! I am planning on selling everything and move into it fulltime. To tell you a bit about myself, I'm an artist, and I am somewhat of a "Handy-Man". I am easy going and can adapt well. Single, Never Married, no children, but I do have 2 dogs. I have a little Jack Russell/Chihuahua dog named Fred. 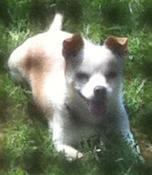 And one full blooded Jack Russell named Rocco. I love gardening and farming. Just being outside. I love water. And love to be around people. I live in Northern Kentucky (10 minutes south of Cincinnati, OH). I love warm weather. The weather couldn't be hot enough for me. I like taking long drives! That's why i'm wanting to move out onto the road and travel. I love hanging out playing bocce (if you haven't played bocce before...you'll love it! ), i like to paint/draw, grilling out, wine tastings, and golf. I am Italian so you can say that I am blunt and confident...lol I love to cook...you gotta love spicy Italian food!!! I love car shows and getting sun. I love going to new places and meeting new people. We love Jeff the Canuck too! Glad to meet ya friend. If you have any questions just feel free to ask! That's what we're all here for I think! Welcome to NuRVers! Happy to have you here with us!